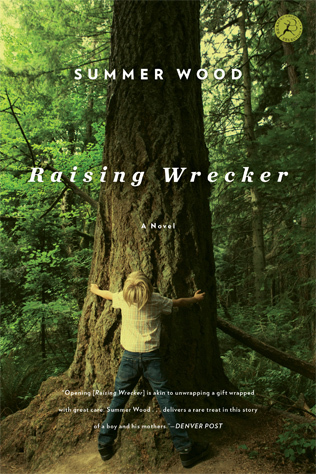 Set amid the giant trees of Northern California’s magical Lost Coast, RAISING WRECKER is a rich and rollicking novel for anyone who has ever raised a son, or loved someone else’s. Book clubs may be interested in the reading group guide. Watch the video trailer on YouTube. WRECKER playlist on Largehearted Boy blog. Thanks to Women Writing the West for awarding it their 2012 WILLA Award for Contemporary Fiction! It’s June of 1965 when Wrecker enters the world. The war is raging in Vietnam, San Francisco is tripping toward flower power, and Lisa Fay – a young innocent from a family farm down south – is knocked nearly sideways by life as a single mother in a city she could barely manage to navigate as just one. Three years later, she’s alone again. Kids aren’t allowed in prison. And Wrecker, scared silent, furious, and hell-bent on breaking every last thing that crosses his path, is shipped off to live with distant relatives in the wilds of Humboldt County. By turns funny, moving, and gripping, Wrecker is the story of a nearly-broken boy whose presence turns a motley group of isolated eccentrics into a real family. Real enough to make mistakes. Real enough to stick together in spite of everything ready to tear them apart. There’s no guidebook to mothering for Melody, who thought the best thing in life was eighty acres of old growth along the Mattole River and nobody telling her what to do – until this boy came along. For Melody, for Len, for Willow and Ruth, for Meg and Johnnie Appleseed, life will never again be the same once Wrecker signs on. And for Lisa Fay, there’s one thought keeping her alive through fifteen years of hard time. One day? She’ll find her son and bring him home. Check back frequently for updates, or sign up to get news delivered to your inbox! Read an interview with Summer Wood about the book.